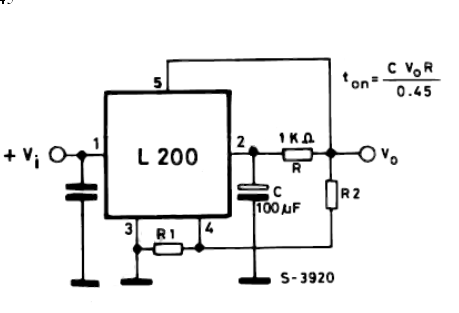 Ic (constant current) is charge capacitor C, where Ic = Vsc/R. The output reaches its nominal value after the time ton. Vo-Vsc=(Ic.ton)/C. Vo follows the voltage in pin 2 at less than 0.45 volt. It is because voltage of more than 0.45 V can’t be produced between pin 2 and pin 5.